Fibre gets installed by a Local Fibre Company. These companies are Chorus, Ultra Fast Fibre, Enable, Unison and Northpower. Spark will be in touch during your installation. You'll also hear from your Local Fibre Company. Before you order, check out the Understand Fibre page to see what you need to consider. If you rent, live down a right of way or in a multi-dwelling unit, you'll need to get consent to install Fibre. The Local Fibre Company can't proceed until they have the right consents. Please note, the Fibre installation process may take a few weeks or more. If you rent your home or business, you'll need your landlord's approval for Fibre. The first appointment after you've ordered Fibre is the scope appointment. This is when the technician will ask you to sign an Installation Agreement. Your landlord doesn't have to attend this but there are ways you can help them give you consent. It's really important to get consent before your appointment. Contact your landlord before the scope to explain you'd like to get Fibre installed. Read the Installation Agreement and End User Terms now. If you both read the terms before the appointment, you'll be more prepared to sign at the scope. You can get your landlord's approval in writing, such as an email or on paper. This way you'll be both be more comfortable. You can invite your landlord to the scope appointment. You can both ask questions and agree on the plan together. If your landlord can't attend the scope, he/she could be available via phone. This is because the installation can involve earthworks on the property. The Local Fibre Company can't start the installation until they get consent. Following these steps can help reduce delays. Getting Fibre can increase the value of your property. It's desirable for tenants if you rent out your property. It's the way forward for consistent broadband speeds. Neighbours who live down a right of way or share a driveway may have to give consent. The build work could cause disruption to the driveway. Your Local Fibre Company will let you know if this is the case. If you’re in an apartment, the owner of the building has to give consent. Body corporates can give consent on behalf of others living there. If you’re in a multi-storey building, the owner of the building has to give consent. You can let those affected know to look out for a consent form, which can speed up the process. 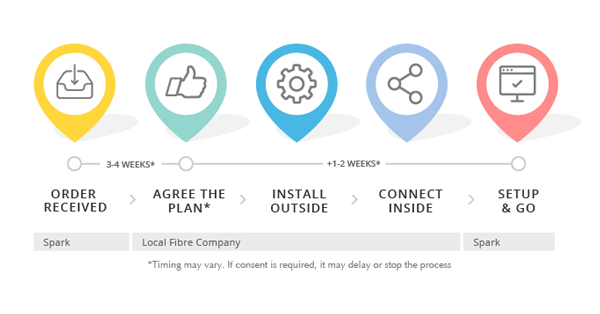 Once you've signed up for Fibre, we'll pass your order to your Local Fibre Company. They'll work with you to install Fibre in your premises. Spark will courier the modem to you before your installation date. Your Local Fibre Company will supply other equipment. Once you’re connected to Fibre, your existing Copper landline will stop working. Your devices won't work in existing phone jackpoints. In order for them to work you can ask for integrated wiring when you order. This may also affect devices like security or medical alarms, faxes or SKY TV. 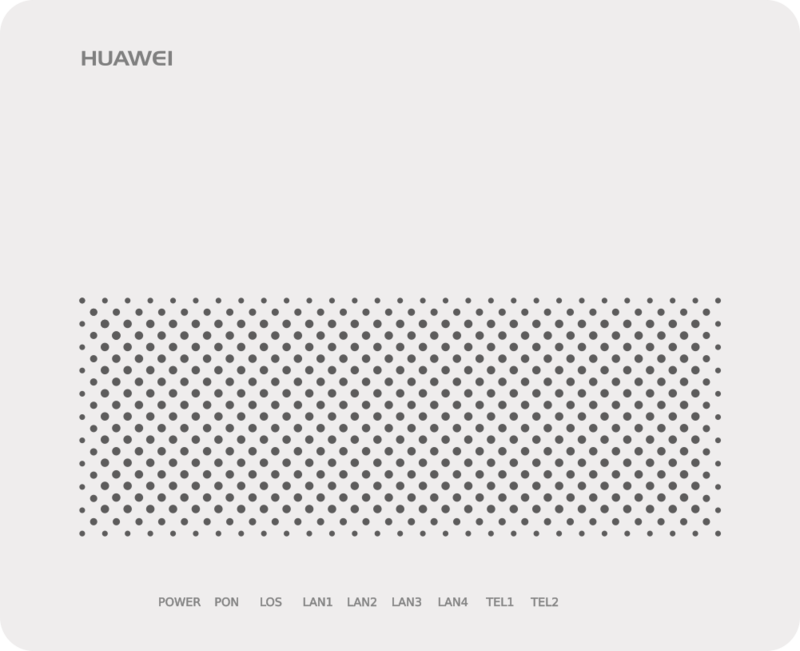 Contact the provider of the device to check if it's compatible. At the end of the scope appointment, you'll sign one of these agreements. If you're a tenant you need to ask the landlord before you sign. Read the agreement before the scope appointment to be more prepared. Enable installation information | Enable installation form | Enable landlord approval form The landlord approval form lets Enable manage the conversation with the landlord if the tenant isn't comfortable to do this. It's not a mandatory form. Track your Fibre order online with the Spark order tracker or in the Spark app. If your Local Fibre Company is Chorus you can book appointments in the order tracker. Unison, Enable, Northpower and Ultrafast Fibre will book appointments on the phone. External Termination Point (ETP). It's a small box installed on an outside wall. This connects back up to the Fibre network in the road. Optical Network Terminal (ONT) or Fibre box. The ONT is another small box, attached to a wall inside your house. It connects to the ETP. It's where you'll plug in the new modem. The ONT should be near at least two power points or a power board. You need to decide if you'll keep existing phone wiring and whether you need it near a TV or computer. The technician will discuss this with you. A Fibre WiFi modem. Spark will courier the modem to you before the installation. You can give it to the technician at the install appointment. 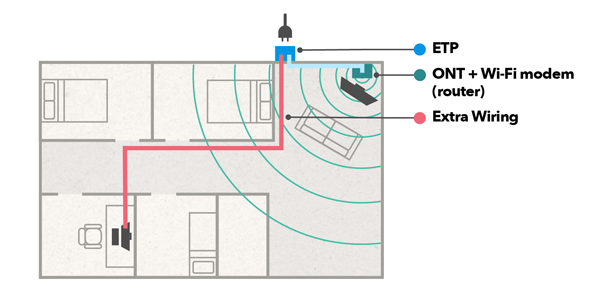 A typical layout shows the ONT and router by the TV and extra wiring to a home office. Once the plan is agreed, the technician will connect the Fibre cable from the street to your land. You don't need to be home for this. The contractor may call you if something from the plan needs to change. The External Termination Point (ETP) is the first piece of equipment to be installed. The staff will do their best to minimise impact on grassed areas. If hard surfaces are affected, they'll be resealed. The build time and installation appointment should happen within 1-2 weeks after the scope appointment. Locate the Fibre box in your house. It will often be on a wall. If you can't find it, you can go outside to find the external box. Once you find that, the Fibre box should be in a corresponding place on the inside. It should look like the images below. Check that it's plugged in to the wall. Check the power and optical/PON lights are green and lit up. Once your modem is delivered you can connect it to your Fibre box. To do this connect the Ethernet cable from the blue WAN port on the back of your modem into the Fibre box. Only one port on the Fibre box will provide service. In most cases this is GE1 or LAN1, but could be other ports. Check the power and optical lights are green, and the correct LAN light is orange. If you don’t see this, make sure you have both the modem and Fibre box plugged in and turned on. 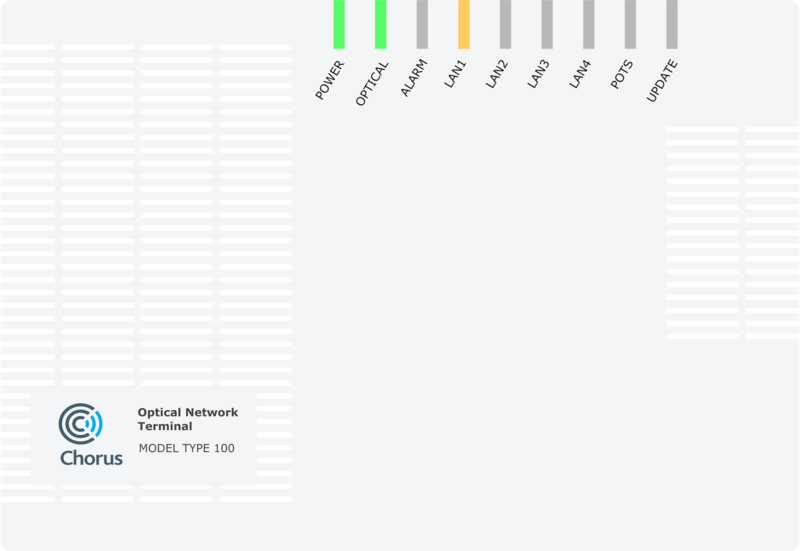 If you find the LAN light is green it means the Fibre box or modem are connected at a lower speed. It's best to try a different cable. 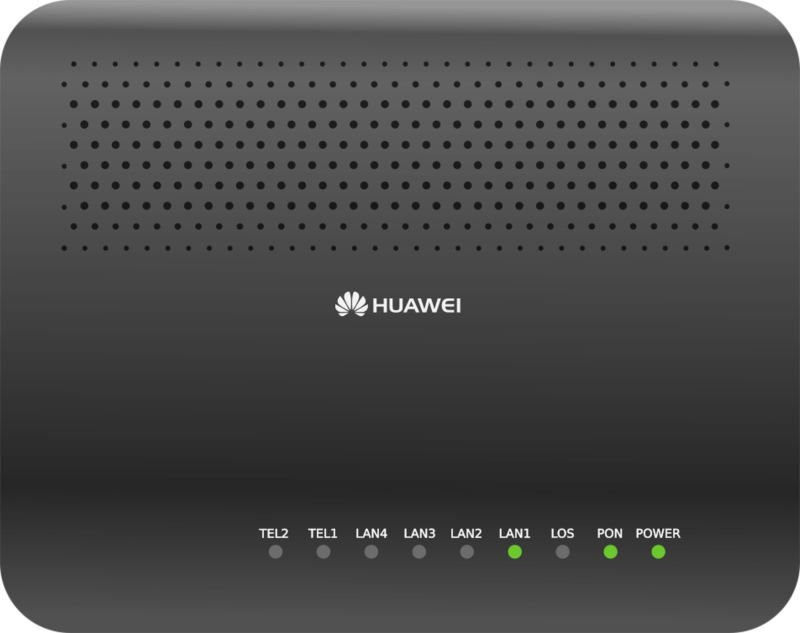 Check the power, and GPON lights are green, the correct LAN light is green, and the LOS light is off. If you don't see this, make sure you have both the modem and the Fibre box plugged in and turned on. The power and PON lights should be green, and the appropriate LAN light on green. If you don’t see this, make sure you have both the modem and Fibre box plugged in and turned on. If the power light is off on the Fibre box, make sure the power cable is connected and plugged into a power point. If the Fibre box has a power switch on it, make sure it’s in the ON position. Please Live Chat with us if you can’t get the power light to turn on on, if the optical light is not green, or if the LOS light is on. There may be an issue with the Fibre box, or the Fibre cable to your address. Once the outside work is done, the technician will install Fibre inside. You will need to be home for this appointment and it takes between four and six hours. Please be home for the whole day. If you have a One Day Installation you will also sign your installation agreement at this appointment. Find out more about One Day Installations below. The Fibre box, also known as the Optical Network Terminal (ONT), will be placed inside. This is owned by the Local Fibre Company and is connected to this house. If you move house please leave it behind. Once you've requested integrated wiring, a second box will be placed next to the Fibre box. Your internal wiring will be connected to the new Fibre line. The modem will connect to the Fibre box and turn on. Then the technician will do a speed test. Your Fibre is now ready to go. Some houses are able to get a scope and installation in one appointment. You'll be informed if this is the case. This means you'll only need to stay home once to get connected. If so, please be at home for the whole day. It will take approx. 4-6 hours. Scope: The first part of the appointment is a scope, also known as the Agree step. This is where you'll both discuss the installation and agree on a plan. You'll need to sign the agreement before work can begin. Connect: The technician will connect your Fibre and you're good to go. Think of a central point in the house for your modem. You can suggest this to the technician. In rare situations, if the technician can't complete the installation on the same day, they can connect everything up inside while you're home. Then, when they come back to do the outside build work you won't need to be home. If the installation is more complex than anticipated the technician may need to meet you at home a second time. If you have monitored security or medical alarms, check they still work with your new Fibre connection. You can contact your security or medical alarm installer to do so. Go to the Understand Fibre page for more information about the Fibre installation process. The install process – for single-dwelling units from Chorus NZ on Vimeo.